This entry was posted in Barry Eisler, e-books, Joe Konrath, Mike Shatzkin, Watch Your Back by Joe Moore. Bookmark the permalink. I haven’t had a chance to read that long back and forth with Eisler and Konrath, but I am utterly fascinated (and overwhelmed) by the speed with which things are changing. Somewhere in the last year, without realizing it, I have in my mind made the switch from dreaming of being published on paper to being published digitally. But, whether print or E, I’m befuddled by the whole ‘how to stand out in a crowd of millions’ thing–which makes folks like Konrath and Hocking even MORE fascinating. I don’t know what the impact is on writers or industry, but one of the most exciting things to me about electronic publishing is that maybe, just maybe, niches that are not served or barely served in print CAN be served by E.
It really is an exciting time in publishing (well at least from an author’s point of view). But it also means I need to work harder than ever to learn how to market, build platform, and all that business stuff that I’d rather bury my head in the sand and ignore. I’m very thankful that yourself and so many authors are willing to share their experiences. Great summary, Jim. And I agree that as an author, I feel more empowered than ever. Through this whole upheaval, I’ve believed that an author and his or her story is a must component in any new equation going forward. And the potential to improve the cash flow with monthly or quarterly paychecks is a nice incentive too. Plus an author doesn’t have to wait months for proposal approvals or 6 months to a year to get a book released, not to mention giving up rights in the process. And we can write the kind of books we want to write for our readers without being second guessed on a story because of a perceived trend or how a book might be shelved in a store. I only wish I had inventory. I’m still planning on submitting a proposal or two through my agent this next couple of weeks, but while I’m waiting for the months it will take for my agent to peddle them, I’ll be writing FOR ME. Thanks for the great post, Jim, as always. It has been an interesting week to watch. Barry Eisler turning down $500K to self-publish and Amanda Hocking’s $2 million deal with St. Martins coming off her successful self-publishing phenomenon. Reading about the auction with nearly every publisher leaping into the fray, I could not help but wonder if traditional publishers really really needed to prove a point by signing on Hocking. Not to detract from what Hocking has to offer—a remarkable fan base that is growing every month, and writing novels that meets the needs of an ever-expanding youth market. She has worked hard and deserves much credit. But—as you mentioned, Jim—traditional publishers have been reeling with everything that has been going on over the last few years. I saw this deal with Hocking, in part, as a way for publishers to clearly demonstrate to the writing world that traditional ways have an indispensable role in this industry, a role that can cannot be easily overcome through self-publishing. But what happens after this point is bought and paid for. Are they going to take to heart the points raised by Mike Shatzkin, Joe Konrath and others, and change the way business has always been done? This is what many of us are waiting to see. The future should be very interesting to watch. It’s hardly a tipping point. Any author who is already making significant coin from traditional publishing has the resources to move into self-publishing and continue to make money. It is, after all, these authors who are generating the money traditional publishers use to publish the works of lesserknown authors. The real question is whether it is worth it and whether the lesserknown authors (the bulk of the authors) have reason to do the same. I would say that the majority of the lesserknown authors who are able to get a publishing contract would be worse off going the self-publishing route. Traditional publishers are able to provide a better quality product with far less overhead per author. If I’m selling a couple thousand books per year, I’m not going to be quite as willing to pay for full editing as an author selling 100,000 books per year. Readers recognize the lack of quality in eBooks and traditional publishing serves as a natural filter. For the wellknown author, the question is whether they really want to be the publisher or whether they would rather leave it to the specialists. Do they really want to spend more of their time managing the publishing side of the business, or do they want someone else to do that? Some will say that they do want to be more involved in that, while other will say that they just want to be a writer. But it also means I need to work harder than ever to learn how to market, build platform, and all that business stuff that I’d rather bury my head in the sand and ignore. That is absolutely the right attitude. And honestly, it’s not that difficult to figure out. Just don’t stress over it. In business parlance, the main thing is to keep the main thing the main thing. Which is to say, the books. Concentrate your best efforts on those. That’s as it should be. Jordan, the cash flow thing is indeed very nice. Monthly. Imagine that! And the ability to write for yourself is a major jazz point. Which means I have a major market now for my stories. How cool is that? Erle Stanley Gardner and Raymond Chandler had to settle for a penny a word in the Black Mask days. Man, how times have changed. I saw this deal with Hocking, in part, as a way for publishers to clearly demonstrate to the writing world that traditional ways have an indispensable role in this industry, a role that can cannot be easily overcome through self-publishing. It will indeed be interesting to see what happens here. By the time her first print book comes out, what will the landscape be like? Will there be even fewer brick and mortar stores in which to sell these titles? Will consumers reject the price point needed for the advance to earn out? After all, Hocking’s legions of fans are used to paying 99¢ for her books! Market forces are changing so fast, yet publishers have to make predictions two, three, four years ahead. No wonder sales of Pepto-Bismol have spiked in Manhattan. I would say that the majority of the lesserknown authors who are able to get a publishing contract would be worse off going the self-publishing route. Traditional publishers are able to provide a better quality product with far less overhead per author. That last sentence is the kicker. With shrinking revenues and tighter budgets it may be much more difficult. Content editing, for example, is not happening as it used to. There are fewer editors and they have more load. Again, it’s just the way market realities affect the industry. For the wellknown author, the question is whether they really want to be the publisher or whether they would rather leave it to the specialists. Do they really want to spend more of their time managing the publishing side of the business, or do they want someone else to do that? What the “well known” authors are asking is whether a 25% e-book royalty split is justifiable. There are new digital companies (e.g., Jane Friedman’s) springing up to offer a much higher slice of the e-pie. These may be the new “specialists” for many A listers who don’t want to manage the publishing side of things. Jim–It’s my understanding from reading Hocking’s blog on the deal with St Martins is the she only sold one series and still plans on selling her self-pubbed discount books. I find it hard to imagine her advance will payout for SMP, not at two million dollars. Her legion of fans are indeed used to discounted prices and it will be interesting to see if they will pay the higher price through a traditional publisher when they can still get books from her cheaper. The other interesting thing about self-publishing in e-books is there’s no guessing game on print runs or waiting to see how well advance orders come in prior to release after a house has already committed to the book. So an author doesn’t have to hold their breath on how widely distributed their book will be in order for readers to even see it on a shelf, or sweat over some middleman distributor having a falling out with the publisher or filing for bankruptcy. And with the major bestseller lists now recognizing e-books, none of these things that can affect books getting into the hands of readers can affect hitting a list. And real numbers can be digitally counted. No waiting game for “reporting”sales. All of these changes will be interesting to see unfold. as a low-techie, avid reader, i would like to make a comment….but i fear my brain imploded mid-blog! My mind also imploded like Kathy D. said. 🙂 But I’ve recoverd enough to know you will have a lot to teach in the upcoming year. 1)How does this effect the newbie in the market place? And future contracts? 2)If you use a pen name like I do what if I want to be Jill Nutter, my real name for non-fiction, and Jillian Kent for historical romance but use my given name for e-publication? It boggles my mind. I’m not worried about this just immensely curious and since I have a full-time day job I don’t think I’ll be self-publishing anytime soon. This is an amazing time for writers and I’m sure everyone is going to want to know what this means for them individually. Thanks for the info. I think there are too many shifting variables in this equation to declare a tipping point. Remember about ten years ago when Stephen King was experimenting with various tweaks to the publishing model? He did a non-advance book, and he did a serial book. If memory serves, he even did a voluntary, pay-me-what-you-think-is-appropriate experiment (although that might have been someone else). At the time, each of these were touted as predictors of a future that as yet has not evolved. Konrath and Eisler are both tireless self-promoters (I mean that as a compliment), and both have effectively positioned themselves as newsmakers: Konrath as among the first to succeed, and Eisler as among the first to secede. Eisler’s position in the legacy publishing sphere will no doubt drive an impressive success with his eBook, and that success will undoubtedly again make the news. Based on these successes, many authors will try the same strategy. Some will see success (however that is defined), most will fail (by any reasonable definition of failure). Like any author who’s been doing this for a while, I have a couple of manuscripts in a drawer (a disk, actually) that couldn’t find a home when I wrote them. They’re good stories, but they were deemed as being not the “right” story for that time in my career. I’m particularly proud of one of them because it took me out of my comfort zone and I pulled it off. Problem was, it’s more of a romantic suspense story than a thriller. It’s not what I’m known for. In retrospect, the publisher was right not to buy it. That was five books ago, and since then, I’ve been blessed with a lot of things breaking my way, not the least of which is my team at Kensington Publishing who deeply believe in my books, and have invested real money and professional talent in my career. It’s inappropriate to share the details now, but the strategy they’ve put together for my next book is just stunning. Faced with all that, my internal ethics meter won’t allow me to self-publish the manuscript that I like so much. What kind of message would that send to the sales people who go out on a limb to push my books into stores? What about my agent, who works tirelessly on my career, or my editor, God bless her, who has fought so hard for me in the halls of Kensington? For me (and I understand that opinions will vary–that I may be alone in this), to step out now would be the equivalent of saying, “Thanks, guys, for the thousands of hours of effort when you were taking all the risk. Now that there’s finally an opportunity to make real money, I’m going to keep it all for myself.” I just can’t do that. I won’t do it. It’s different for authors who’ve been dropped from their houses. In those cases, money still has to be made, and the publisher has already played its hand. Part of me doesn’t believe I’m writing this, even as I write it. When it comes to business, I’m usually as hard-hearted as they come. But I also know when people have gone out on a limb for me as my world was getting pretty dark. Sometimes business is about doing the right thing. I’m just enough of a Pollyanna to believe that if I keep that as my goal, the rest will follow. There’s an aspect of this move on Barry’s part that so far I haven’t seen anyone mention, which is remarkable. The publishing world still exists largely on the basis of handshake deals. In fact, I’ve rarely had a signed contract in hand while working on a book. For my second book deal, the cover design was finalized before the contract. Currently, I’m halfway through writing a book for HC and waiting on the final contract. Because in this industry, your word is still supposed to mean something. As my agent said, once the broad strokes of a deal are settled, in that the publisher has agreed to buy the book and you’ve agreed to sell it to them, the deal is considered done. Barry didn’t just “move to self-publishing.” He had a deal that, as far as his agent and St Martins were concerned, was settled. So settled, in fact, that was announced in the trades. And then he walked away, leaving everyone else involved with egg on their face. So what if on the basis of this, publishers now decide that they’re entitled to back out of handshake deals? What if they’re on the verge of mailing that contract to your agent, when suddenly Andy Martin decides that maybe zombie bounty hunter ghost stories aren’t quite as hot anymore, and they’ve changed their mind about that book of yours they agreed to purchase? Maybe that’s a good thing. Maybe we should all have signed on the dotted line before sitting down to our keyboards. But I’ve always kind of liked the fact that there’s still something of an honor code in this industry, at least among the vast majority of players involved. I’m really hoping that this works out for Barry. Because the way that it transpired means that he probably wouldn’t be able to return to “legacy” publishing if he wanted to. A lot of bridges were burned along the way. Personally, considering all the dead ends that exist in the world, I’ve always believed that it’s a good idea to keep the path behind you open. Sure, self-publishing might have reached a tipping point. But this isn’t a model I’d advocate anyone following. John, you raise a lot of good points, as usual. Let’s keep the conversation going. It’s helpful. I do think this is a “tipping point” in this regard: things have changed massively and they’ll never be the same again. 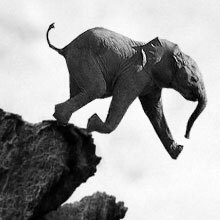 The elephant is not going to be able to back up to the top of the cliff. Adjustments will have to continue to be made, so we in a new era. The key question, So now what? is not amenable to easy answers. There’s also going to be different answer depending on one’s position. If you’re with a publishing house now, and they are working hard for you (as in your case, John) it would not only be unethical, but also most likely a breach of contract, to go into competition with them. If you’re in a “happy family” one owes the family fidelity. I believe in loyalty. Of course, as Tolstoy said, all happy families are alike; every unhappy family is unhappy in its own way. And those who have been asked by their family to move out (i.e., we’re not going to be publishing you anymore), the perspective will be quite different. BTW, John, why wouldn’t Kensington be okay with you publishing that novel? Too off brand? That may be old style thinking in this brave new world. I could see it as a chance for you to make a ton of new readers. Those are the sorts of discussions that should be taking place between publisher, author and agent. Michelle, clarify that last statement for me. You’re not saying self-pubbing is the wrong road for any writer, are you? Or is that limited to the “burning bridges” scenario you described? I think it’s a tipping point in that the publishing industry (the industry, not just the big 6 pubs) is in for some radical changes based on these two events (Eisler & Hocking) and they will be good for the writer. Publishers won’t become extinct, but they do need to reevaluate how they do business, how they find their talent and how much they invest in that talent. But using Hocking as an example, they can do it with less risk than in the past. Going this way, agents won’t become extinct either. Hocking said herself you need a good agent to help you go through what she just did. As for Eisler, it’s the opposite side of the same coin – as you said, how indie and trad publishing can work in tandem, even with the same author. I’m most excited about what all this means to writers and readers. I actually think that for an established marquee author, self-publishing once their contract has been fulfilled could definitely be the right move–and that publishers might have to scramble to change their model in order to keep “legacy publishing” (does anyone else hate that term?) relevant. Say that Stephen King and James Patterson decide to go it on their own once their current deals are completed-that would truly cause shock waves through the industry. Even for less established authors, this might be the way to go. However I, like John, am sticking with the traditional route for the foreseeable future for a variety of reasons. It makes foreign deals easier. My books remain eligible for awards. I’ll still have membership in professional organizations. This might mark the tipping point, but the fact that on the very same day that Eisler announced his move, the current top-selling self-published author went the opposite route is telling. I don’t think there’s anything to be lost, at the moment, by pursuing both options. I know a lot of people (Brett Battles, Marcus Sakey, Robert Gregory Brown) who are releasing short stories on Amazon at a low price point to draw readers to their other books. Nice post, Jim. Is this the beginning of a seismic shift in the publishing industry? A tipping point? I have no idea. But I can tell you about a trend I’ve been watching over the past year or so. Because of my position on the ITW board of directors, I see every application from every publisher seeking to be added to our recognized publisher’s list. And things are changing. The majority of applications we get nowadays are from start-up publishers, self-publishers, small (and I mean really small) regional publishers, obscure, off-the-wall publishers, and a whole new batch of what I call “garage” publishers. I think this trend is only going to grow as more writers shift away from legacy models. It’s important to note that the difference between ‘good’ and ‘bad’ literature has always been extremely subjective. Very few of the works we consider classics were commercially successful when they were initially published, and it’s safe to say that the highest quality of writing rarely guarantees success. Also noteworthy is the way publishers have embraced this new tech in the same manner that they embraced ‘pulp’ nearly 100 years ago. They’ve hired thousands of new authors and have been scrambling to publish everything they can get their hands on… Or NOT. As Konrath and Eisler pointed out numerous times, publishers seem to have forgotten their purpose. They could have snatched up thousands of eager writers and published them quite quickly and cheaply. Instead, they veritably closed the doors to new writers, and in the process dumped many of their midlist authors as well. And then they began price-fixing in an effort to crush the growth of e-books, and trapped their writers in damaging and unrealistic contracts for digital rights. This is a generalization, of course. It doesn’t speak for all publishers, but rather enough of them that we can see the effects across the entire industry. While the loyalty of some authors to their publishers is laudable, I think those writers are in the minority. In the meanwhile, the world has moved on. In typical big-corporate fashion, publishers are now scrambling to figure out how to fix the problem that was of their own devising. I know a lot of people (Brett Battles, Marcus Sakey, Robert Gregory Brown) who are releasing short stories on Amazon at a low price point to draw readers to their other books. Exactly why I released Watch Your Back. Thanks for stopping by, Kristie. Joe, I can’t even begin to know what criteria ITW will use to make those decisions. It’s getting awfully murky in these waters. Jordan M., you indeed present a view that is held by many. And it’s true that large industry is not geared for rapid change. It is a scramble all right. BTW, just want it clear that when I used “dreck” I meant not subject matter or genre, but just flat out bad writing. You don’t become a novelist overnight, even if you cab publish anything you produce. James, I’m fascinated by this whole discussion. I’m not yet published, and my head is reeling at the rapid changes in the industry. More than anything, I’m happy with all the choices writers have. I’m off to check out “Watch Your Back.” I love short stories and epubbing is saving a genre that was in a world of hurt when so many magazines folded. Later this year I plan on Kindle-izing my short story portfolio. These are stories that have all been previously published (some for pay, some not) or were contest entries that placed well. Therefore, all have had a least a bit of editorial vetting. They are all reprints, therefore not particularly easy to sell and are not doing me any good sitting on my computer. I hope more authors kick loose with short stories and experimental or off-brand works via e-pub. I was a big fan of King’s pay-as-you-go project “The Plant” and was sorry to see it fold. Anything that gets good stuff on my Kindle at a reasonable price is made of win as far as I am concerned! Update: “Watch Your Back” is sitting in my Kindle file and I plan on checking it out tonight. Any other KillZoners have some shorts tucked away in their virtual drawers? Family? Are you kidding me? The publishing industry is family like the Corleones are family. Yeah, there are good people in the cubicles, but it’s the bottom line that runs the place. Pardon me while I dab my eyes at all the happy talk about families and loyalty. You think for one second if you don’t earn money for the “family business” that your family is going to hold you to their bosom and help you get to that place? You think they’re going to be loyal to YOU? I’ll tell you what happened to me. I had a two book contract. A good contract. Book 1 I did everything I could to sell it. Pub didn’t give many marketing dollars, but did some. When book didn’t live up to expectations, guess what they did for me for Book 2? Jack Crap. Yeah, family. Like Fredo Corleone sitting in the boat fishing, that kind of family. I’m glad I’m out of it and can self-pub and make real money, which I am. Julie, heads are reeling and imploding all over the place. Welcome to the jungle. Terri, thanks for taking a shot with Watch Your Back. We ‘Zoners, I might add, have a collection called Fresh Kills, which is also available for all e-readers. We strut our stuff there. Anon, well….it is a business, and we know that going in. Businesses have to make a profit. I know there are editors who die a little inside when a project they’ve nurtured doesn’t do as well as they’d hoped. Yes, the bottom line is the bottom line. Perhaps best to see this as just the cold hard reality, and not a Mafia film. But the point is, instead of ending up like Fredo, you have a chance to go into your own business now. That’s what the tipping point is about–choices. What a fascinating conversation. I’ve been following both stories, but what I’m amazed at most is how level-headed and logical Amanda Hocking is. I think you mention this in one of your comments but the take away for me is that Amanda and Eisler both made decisions based on what they felt was best for them at the time. I don’t know about Eisler, but Amanda mentions several times on her blog how she did not make this decision lightly. She consults with her agent, a lawyer, and an accountant. She made a business choice for a set of three books and knows it’s a risk based on a business model she had already been following, but it’s a risk she’s willing to take because she wants to write, not design book covers. I, too, hope this doesn’t turn into a debate about how much better or worse self-publishing is over traditional publishing. Seems like we’ve been there, done that. I know what I’m going to do. I’m going to attempt to stay informed about the ever-changing industry, keep learning and writing, and when the time comes, make an informed decision on how to put my writing on the shelves, whether it’s literally or virtually. Of course, this mindset misses the point entirely. I attended Sleuthfest a few weeks ago. It was populated with a lot of the New York types, and I was stunned at how far into the sand their heads are buried. I posted a detailed blog on my own website, but what it boils down to is, they really don’t want to think about any of this. They’re hoping it’ll all go away in the “tsunami of sludge” that they warn will surely wash up on our shores as a result of flinging open the gates to publishing. This, mind you, from the “gatekeepers” who gave us Snooki. I’ve got one traditionally-published novel and a self-pubbed short story collection. I’ve also got three noir novels all ready to go and I’m just about sold on self-pubbing them. Up until just a couple of months ago (!!!) I wouldn’t’ve even considered self-publishing, but the steady drip of the tide of history has pushed me in that direction. In regards to Hocking earning out – only time will tell. But I believe there are legions of readers who don’t buy her ebooks or only bought one, who will think she is now legit and so buy her traditionally pubbed books. It’s all in the writing. Wow, still more permutations and thoughts here. Doesn’t this comment section demonstrate the very (tipping) point? No one really knows what things will look like a year from now. It’s like the Oklahoma land rush. Who knows if there’s oil in the ground where they put down stakes, or just dust? They paid you, though, right? They laid down a bet that more people would enjoy your story than actually did, and they are forever out of the money they spent, because that money is forever in your account. That is, at the very least, jack crap. Shame on them for betting wrong. I’m going to guess that you didn’t feel so compelled to return the unearned advance. Yeah, what jerks they were. Anon’s post illustrates the speciousness of so much of the self-publishing argument. The aggrieved author is going to teach Big Publishing a lesson by investing dollars to make pennies, instead of allowing Big Publishing to do it for them. Yeah, right. Good luck with that. Extending Anon’s Corleone metaphore, it isn’t personal, it’s business. Which is exactly the way it’s supposed to be. But there’s a personal element in every worthwhile business transaction. There are countless great reasons to self-publish these days, but revenge isn’t a great reason to do anything. People have said for awhile now that this change is coming. Slush deluge, revenge publishing, new business model. Call it what you will. I agree that a surprising majority of traditional (okay, so now we’re calling them “legacy” publishers) are willing to keep their heads in the sand about the coming change, refuse to really talk about it, and believe they’ll just ride ou the change when it hits. Thing is, change is not coming. It’s here. Last week’s news proves this. What won’t change, though, no matter what, is that THE ONLY WAY authors will gain the long term trust of readers (in whatever form they choose to read) is to deliver consistently excellent content. I know that isn’t the topic of your post, Jim. But to me, that is the tipping point that needs to be considered when an author is making this decision. Sandra, I totally agree. You have to produce books people want to read. Period. Unless you do, no matter what kind of publishing you go into, the career will be a short one. Man, this is like the Wild West. (I just watched Rio Bravo again, so that might be driving the metaphors). But truly, it feels that way. We have kid gunslingers coming into town to get revenge (Anon) and a sheriff telling him to leave his guns on the fence (Gilstrap). We even have an honest to goodness saloon dancer (Gagnon). But the territory is in an upheaval. The big landowners who’ve run things suddenly have all these squatters all over the place. And a lot of them are drinking plenty of whiskey. Who knows what new order will emerge? Oh, for Pete’s sake. Why do I always have to be the saloon dancer?! OK, OK, Michelle is now the deputy sheriff and Miller is the saloon dancer. Sheesh. Miller has better legs anyway. I’m not published and haven’t gone through the experience of walking a book from draft to publication and the inherent dealings with the many people who make it happen–editors, marketers, cover designers, etc. On the other hand, from my study of the industry over the last few years, traditional publishers seem to offer less and less services to authors, while still taking most of the pie. So would this not seem to generate an environment, since authors have to pretty much do much of the work themselves anyway, where authors form a co-op to help each other through the process of indie publication? Authors are not just authors–some excel as editors, graphic artists, etc. Yes, there is a price to be paid for being your own boss, but that has always been true. I will also be very curious what impact these changes have on authors as a community, and what will be the stance of the many professional writers organizations with regard to indie publishing (ie. ACFW, RWA, etc etc etc). Writers conferences, for example, are sponsored in part by traditional publishers. So it would seem writers organizations are conjoined with trad publishers. What difference does that make, if any? I don’t mean to imply it’s an “us vs them” mentality, but still, the question is valid in this whole shakeup. Ooh….can I be the crusty old sourdough miner who keeps showing up with wise cracks and accidentally heroic escapades that he never really figures out how he got into but always somehow manages to survive without losing his scalp and returns home to his hot native wife and pet grizzly bear who thinks its a lap dog. Yeah, that’s my part…the miner who never struck much gold but sure had a fun time getting down in the dirt. And while I question the idea of Miller’s bared legs in the saloon, Michelle sure makes one hot sheriff. She could start a Wild West Kill Zone Angels with all our other super model authors. Basil, you would be perfect in that role. Think Gabby Hayes with a touch of Walter Brennan. Or the other way around. I remember the days, not long ago, when taking the self pub route (now called indie?) was the career killer – the sole publishing method available to the no-talent wannabes. Now terms like tipping point are being used & traditional publishing (now called legacy?) is compared to the Corleone’s? Yikes. Both attitudes seem extreme to me. I CHOSE to self publish in 2008 & again in 2011. Never submitted to an agent, not because I had an axe to grind with TPs, then or now, & not because I lacked confidence in my work. It was just right for me. I don’t think traditional is dead, nor do I think that authors jumping ship will kill it. I do think publishers will adapt, repair the business model (like the returns policy – better royalties for authors on ebooks, & reduced pricing on ebooks) – it might just take a while. And who’s to say Amazon, B&N, etc won’t change their business model to something less appealing for authors at some point in the future? 70% today might be 10% tomorrow. Guess I just don’t care for “smug” attitudes – either way. Jax. well put. There doesn’t seem to be any need to be “extreme” here. But I know feelings are raw on both sides, and sometimes that comes out as a Mafia movie metaphor. Maybe we should find a different metaphor. Maybe self-pubbing authors are looking for Pandora (the planet, not the gal with the box). Funny thing is, for the writers it can seem like the planet, and for the publishers it can seem like the box! Continuing the Wild West theme, I saw a great cartoon that, if you think about it, applies here. Mike, I truly think you have something there. Wouldn’t have missed Fresh Kills, it was fantastic and I hope the Zoners do more anthologies like that. Can I be the out-of-place-but-plucky-professional-woman like Dr. Quinn MD? I tend toward the middle ground that there is room for both the models. Some indies will build up nice niche followings and may (or may not) make it into mainstream pubbing. A friend of mine is e-pubbing his memoir with a nano-press. It is a dirty gritty accounting of his life on the street and trips through juvie detention, big boy prison and a “school for wayward children” that is now being closed after being revealed as a basic torture factory. No romance, not much in the way of redemption, no superheroes, no feel good ending. Not exactly Random House material, but I’ve read the sample chapters and they are compelling. There is room for his story to be told and I can’t wait to read it. So, I look forward to all that is coming down the pike, whether is has a printed cover or an e-ink cover. BTW: Gotta side with John on anon and his failed 2-book deal. I should have such problems. Terri, “fling” seems vastly appropriate, doesn’t it? The number of comments here says it all. We authors are, I think for the most part, not business persons, or effective self-promoters. My first editor, Beverly Lewis, told me once, “Your job is to write, and ours is to sell what you write.” That was the way it had always worked, and it worked pretty well for a very long time. I cannot speak for other houses, but Bantam gave me a lot of major support for a long time and they kept printing my books for a long time when they were not being as well rewarded as we all hoped for. But I can say that Beverly Lewis and Kate Miciak gave my work their efforts and stood up for me, believing that my big breakout was going to come. I believe it will happen yet, and I know Kate does, as does my agent, but we all know that it is up to me to write that book that will open the gates wide. I may self-publish ebooks, and I may not. Time will tell. I for one have not one bad thing to say about my publisher. So would this not seem to generate an environment, since authors have to pretty much do much of the work themselves anyway, where authors form a co-op to help each other through the process of indie publication? Authors are not just authors–some excel as editors, graphic artists, etc. I’m a member of just such a group. We’re self-publishing under a common imprint with its own website. The intent is to pool our knowledge (one of us knows her way around websites, another is an editor by trade, etc.) and our marketing power, such as it is. We also provide quality control, a sort of post-beta-read, on each other’s books. The experiment is ongoing. I expect a lot more such experiments will start appearing, as writers test out new ways to navigate the changing landscape and get our names out there. We live in interesting times…. I like to think that was a matter of policy and he didn’t know me. The other alternative is too unpleasant to contemplate. I don’t mind rejection from publishers or readers, but authors? John–The wording of Barry’s message sounds like bad manners, but its a facebook thing. If an author gets 5000+ “friends”, no more can sign on. They are tapped out. So an author must set up a fan page and get folks to move over where the higher numbers are allowed. The simple truth is the publishing industry is undergoing the same digital evolution as seen in music, video games and movie rentals, with the same disruptive, cataclysmic effects upon the incumbent gate-keepers. The proxy in music occurred in 2007 as Universal Music, one of the big-4 music labels at the time, lost a major band. If it seems similar to the Eisler decision, well, it should. In my opinion, guided by experience in two previous digital shifts, the “tipping point” comments are correct. It has happened. For better and for worse you (the authors) and the publishers, respectively, are now on the other side of the tip. The rate of change that is being referenced in the comments is in fact “mainstream market momentum.” This momentum is not being driven by the ability to self-publish to digital. Technically, that has been here for over 10 years. It is being driven by device penetration (consumer purchase of Kindles, Nooks, iPads and Android tablets) and access to a large library of CONTENT created by YOU the AUTHORS. The same market momentum was seen with color phones in 2002 as mobile games and ringtones became a $2B+ industry almost overnight as a large content library was made available. It was also seen in the DVD market when DVD player prices hit sub $99 (December 2003) and the massive library of old movies on DVDs became available at $14.99 and $19.99 vs. $29.99? Boom. Goodbye tipping point, hello mainstream market. Today, musicians and writers have been empowered. Yes, the door is open to self-publish and many are walking though it (Eisler, Konrath, Switchfoot, Madonna, Radiohead, Nine Inch Nails, etc). While many artists can self-edit, convert digital files, and submit to digital stores such as iTunes and Kindle, many artists simply desire to create their art in word or song. Some are capable or staffed to self-publish, while others are seeking partners to help with the process. Jim asked, “What does it mean to the industry and what does it mean to you.” So, WARNING: SELF PROMOTION. You may be saying, “Oh no, here it comes.” You are free to hate on me with great articulation because most of you are, well, writers. Here goes: My day job is CEO of GoTV Networks, a mobile media company. I have been incubating a new digital publishing business with a fellow multi-platform digital media veteran. We have built Premier Digital Publishing, PDP, (stealth, no website) to help established authors successfully navigate the digital waters and garner their fair share of the pie. The mission of PDP is for the creators of IP (Intellectual Property, not Internet Protocol, ha, ha) to be deservedly rewarded for producing the art forms THEY created. Sure, the ebook storefronts (new retailers) do deserve a share of the pie, but the old publishing model and its revenue splits is fatally encumbered by the weight of legacy systems, overhead, bloated staffs and prevarications a.k.a. royalty reports (wicked wink). As the story goes, I can go to Lowes and buy $500 worth of equipment to mow my lawn each weekend, but why not pay a “group of guys” to do it for a reasonable cost? (If you live in California – don’t translate “group of guys” into its politically incorrect term). You get the point. Welcome to the other side of the tipping point. Radiohead and Eisler are now perpetually famous. James Scott Bell asked: So does the Eisler Sanction feel like a “tipping point”? What do you think it means industry wide? What does it mean to you? The simple truth is the publishing industry is undergoing the same digital evolution as seen in music, with the same disruptive, cataclysmic effects upon the incumbent gate-keepers. The proxy in music occurred in 2007 as EMI, one of the big-4 music labels, saw Radiohead go direct. If it seems similar to the Eisler decision, well, it should. In my opinion, guided by experience in two previous digital shifts, the “tipping point” comments are correct. It has happened. For better and for worse you (the authors) and the publishers, respectively, are now on the other side of the tip. The rate of change that is being referenced in the comments is in fact “mainstream market momentum.” This momentum is not being driven by the ability to self-publish to digital. Technically, that has been here for over 10 years. It is being driven by device penetration (consumer purchase of Kindles, Nooks, iPads and Android tablets) and access to a large library of CONTENT created by YOU the AUTHORS. The same market momentum was seen with color phones in 2002 as mobile games and ringtones became a $2B+ industry almost overnight as a large content library was made available. It was also seen in the DVD market when DVD player prices hit sub $99 (December 2003) and the massive library of old movies on DVDs became available at $14.99 and $19.99 vs. $29.99? Goodbye tipping point, hello mainstream market. Second, what does it mean to me? WARNING: SELF PROMOTION. You may be saying, “Oh no, here it comes” but I want to make a point. If you want, you can hate on me with great articulation because most of you are, well, writers. Here goes: My day job is CEO of GoTV Networks, the largest mobile media company. In fairly stealth mode I have been incubating a new digital publishing business with a fellow multi-platform digital media veteran. We have built Premier Digital Publishing, PDP, to help established authors successfully navigate the digital waters and garner their fair share of the pie. Our opinion and the mission of PDP is for the creators of IP (Intellectual Property, not Internet Protocol, ha, ha) to be deservedly rewarded for producing the art forms THEY created. Sure, the ebook storefronts (new retailers) do deserve a share of the pie, but the old publishing model and its revenue splits is fatally encumbered by the weight of legacy systems, overhead, bloated staffs and prevarications a.k.a. royalty reports (wicked wink). Today, musicians and writers have been empowered. Yes, the door is open to self-publish and many are walking though it (Eisler, Konrath, Radiohead, Nine Inch Nails, etc). While many artists can self-edit, convert digital files, and submit to digital stores such as iTunes and Kindle, many artists simply desire to create their art in word or song. Some are capable or staffed to self-publish, while others are seeking partners to help with the process. Once upon a time about a month ago, big Pub “A” cheerfully offered to send an agent a proposal to bring 5 backlist titles to ebooks. Said titles, originally published by medium Pub “B,” are most definitely out of print and, as the agent, lawyer and author interpret the contract, ‘nearly’ reverted (we need that termination letter!). Regardless of the potential future legal wrangling with Pub B, these titles never had ebook rights contemplated, assigned or articulated in any way. Thus, the agent, lawyer and author felt comfortable receiving a proposal from Pub A. Some weeks later, the author was sitting at home ruminating over a plot twist when the agent called. The agent had received the proposal from Pub A. His resultant emotional state was an odd triangulation of flummoxed, incensed and apoplectic. The proposal offered only 25% share of the net proceeds received from the usual ebook suspects. Previous verbal indications had, albeit weak, clearly suggested somewhat better financial terms. The proposal went on to require a 5-year term and provided for an additional 5-year term at the publisher’s option. It also required that if print rights (or derivative rights including TV, Movies, etc.) ever reverted to the author, such rights would be summarily assigned to big Pub A as addendums to the eBook agreement – with no promise, however, of actually printing any of the titles in the near or distant future. Needless to say, what began as an ebook proposal discussion arrived as a Trojan horse contract containing clauses to gather all rights unto Pub A. In effect, big Pub A would perform a rather methodical assimilation of omnibus rights to the 5 book series. The lawyer pointed out, appropriately, that such treatment is usually reserved for weaker inmates cornered in the prison shower. The agent agreed with the lawyer but suggested he calm down. The agent had identified a newcomer digital publisher who provided a compelling ebook net revenue split (85% author / 15% publisher) with merchandising and social marketing services. The author agreed and is back to writing, which he wanted to be doing in the first place. Anon 2, you have added a prison shower metaphor to the mix. This truly is getting interesting. Even more interesting is this new split from a new digital publisher. I suspect we are going to see more and more of that in the years ahead. God, I’m glad Barry wasn’t singling me out for exclusion based on something he knew about me. I’m also glad he has 5000 + friends. I’ve had one book appear in digital and POD formats via a “digital first” epub and it has garnered few sales. This is with blog tours and all my usual promo efforts. So what’s the secret to marketing success? You’ve got me. Right now, most of my fans prefer my books in print, so I’m still aiming for that market. I’m not ready to give up my agent and the traditional pub markets yet. This is a fascinating but mind-boggling discussion! John said, “Konrath and Eisler are both tireless self-promoters… and both have effectively positioned themselves as newsmakers.” I think we’d have to add Hocking’s name, too. The amount of publicity that has been generated for them by all of our discussions around the blogosphere has to be helping their sales. Personally, I feel like the Sundance Kid, perched on that cliff, terrified of jumping but equally terrified of staying put. I will definitely need an agent to hold my hand when the moment of decision-making arrives.